What a terrific day yesterday for our first Vincent Wine Company open house with Helioterra Wines. We had somewhere between 200 and 300 people at the winery, despite rainy weather. How great to see lots of old friends and meet lots of new ones. We also previewed our Guild Winemakers white and red wines, a co-op project doing with several local winemakers that’s just hitting the market. 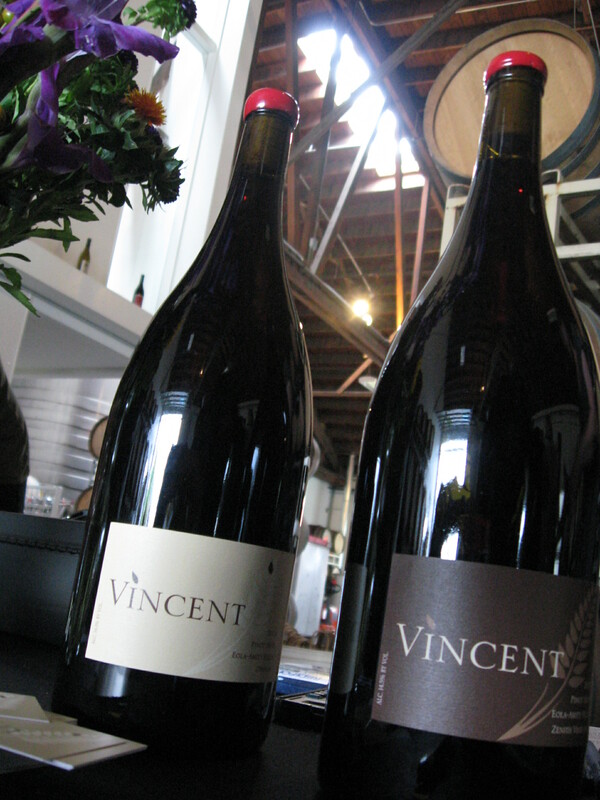 Response to our 2009 Vincent Pinot Noirs was strong. People especially liked our 2009 Zenith Vineyard bottling, which is going quick. Just a few cases remain. We’ll be going around to local shops and markets with our main wine, the 2009 Vincent Pinot Noir Eola-Amity Hills. At 192 cases, it’s our big production wine (I kid). We’ve already sold a bunch, but there’s more if you want some or want more. Just let us know. Thanks especially to all the volunteers who helped make a very crowded event a huge success. Great to have so many new people on the mailing list. And of course thanks for everyone who came out, who tasted and said hello and who took home some of the wines. Oh, here’s a write up on Wine Berserkers of one attendee’s impressions of the whole event. Pretty nice stuff, if I do say so myself. This entry was posted in Uncategorized on September 19, 2010 by vincentwines.